Experience the AXOR Starck bathroom collection on the new AXOR website. AXOR Starck is a timeless bathroom collection that will never go out of fashion: it is characterised by minimalist aesthetics and purism, and it focuses on the basics. With his completely new perspective on the bathroom as a “Salon d’eau”, Philippe Starck has fundamentally revolutionised the bathroom. The extremely linear design of AXOR Starck is timeless, and bathroom customers the world over have never ceased to be impressed by it ever since it was launched more than 20 years ago, with great success: a design that offers tranquility and relaxation. AXOR Starck offers basin mixers in various heights and three operating variants: ranging from the joystick and the 2-handle version to the 3-hole mixer, which is also available as a wall version for the wash basin. For public and semi-public areas, you can also opt for an electronic basin mixer. For showers and bath tubs, single lever mixers for exposed and concealed installation, concealed installation thermostats and various bath mixers such as the floor-standing bath mixers are available. 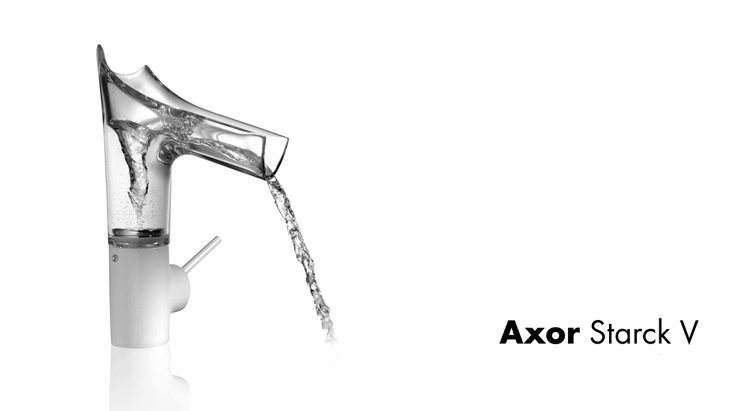 The first glass mixer from the AXOR brand illustrates the vitality of water in the form of a vortex. It combines organic and sculptural design with outstanding ease of use. The spout can be swivelled 360° and, thanks to its easy-click-in design and safety-stop function, is easy to remove – for easy cleaning and optimum adjustment. AXOR Starck V is available in two heights and as a 2-hole mixer. For all variants, the handle can be positioned on the left or right. AXOR Starck X single lever basin mixers come in four heights. Electronic mixers and a version for the wall are also available. Various exposed installation mixers, thermostats and valves plus a floor-standing bath mixer are available for showers and bath tubs. The range of products is completed by a bidet mixer. 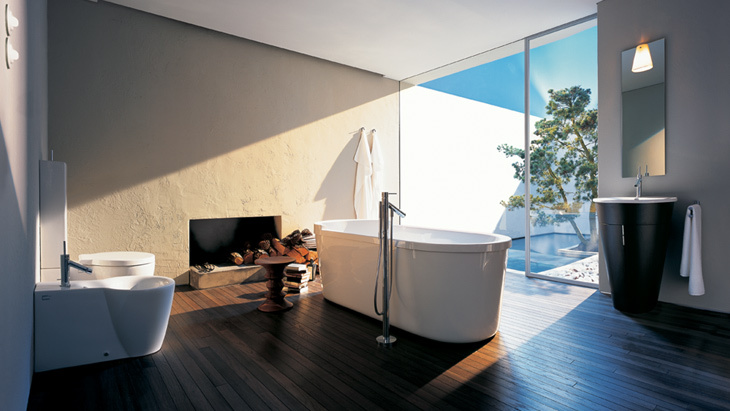 The AXOR Starck bathroom is characterised by multi-functional shower systems and minimalist hand showers. The AXOR Starck shower columns combine overhead and hand showers with a thermostat. The Waterwall beautifully integrates all the key shower elements, ranging from the mixer to the plate overhead and side showers through to the shelves. Other plate overhead showers are also available in various diameters and projections. The French designer's aesthetic minimalism is also reflected in the AXOR Starck accessories: soap dish, single hook, towel holder, toothbrush tumbler, wall lamp and lots more. With these furnishing elements, you can offer your customer a coordinated bathroom ambience. AXOR Starck offers you an impressive range of products for chefs who are also lovers of design. Characteristic features are the joystick handle and an adjustable swivel range. In both variants with the high spout, you can position the handle on the right-hand or left-hand side. The version with hand spray offers an expanded operating radius. With a 360 degree swivel spout on a stainless steel spring, the AXOR Starck Semi-Pro is ideal for double sinks and island solutions.